Sadly, most of us will experience some kind of vehicle misfortune in our lifetime. I read recently that, globally, there are approximately 3,287 deaths per day related to car accidents. In the United States alone, more than 90 people die in car collisions every day. We, at DrivrZone, take safety tools seriously. When it comes to our readers’ safety, our writers work long hours reviewing and rating products that we feel are the best of the best. Accidents happen, and it’s usually not a matter of if, it’s more like a matter of when. We always strive to give you, our readers 1) the best knowledge you need, and 2) the best resources you need which will allow you the greatest decision-making abilities when it comes to safety and the investments you make for safety in your vehicle. Isn’t that why you come here – because you trust us? Accidents are just that, they are unfortunate circumstances and can cause terrible consequences if you are unprepared. The majority of car accidents are human error, some can be prevented, but not all can be predicted. One thing we know for sure is, we at DrivrZone, can recommend safety escape tools to better prepare you in the event of an unexpected accident or emergency, and you are needing help or a sudden escape from your car, truck, camper or boat. Mechanical malfunctions can leave you stranded, mother-nature can wreak havoc on the roads, or a sudden onset of a medical illness could impair you and your driving skills. Whether it be a minor fender-bender or a full-blown head-on accident, we want you to remain calm and prepared in the event of an emergency. With most safety tools, it is better to have it and not need it – than to need it and not have it, correct? No one walks out of their house in the morning with their coffee and children in tow, expecting to be involved in some sort of an emergency that requires the use of safety tools. Breaking down the door at number one is the INGEAR autoXscape Car Emergency Multi-Tool. After reviewing this window breaker, it is no wonder this superior emergency tool ranks at the top of our list. Constructed with military-grade aerospace aluminum, this strong window breaker is designed to help get you and your family out of danger if the unthinkable happens. This is a mighty, compact, ergo-friendly tool boasting numerous functions. The rubber handle with a textured grip makes it easy to hold in both cold and wet conditions. We really like the endurance of this tool. This window breaker is equipped with a bright LED flashlight. It has 3 levels of brightness: high (135 lumens), low (50 lumens), and an S.O.S strobe, which is vital in an accident. Also included is an adhesive mount (and screws) to install anywhere, increasing your flexibility in the event of an emergency. The seatbelt cutter is built with a long-lasting carbon steel blade and will slice through the strongest seatbelts when the time is not on your side, or your belts unexpectedly jam! This window breaker is created with durable tungsten steel cutting edges and points, sharpened and honed to quickly break any tempered vehicle window. You'll be ready to power your way out of the worst situations with the Ingear Window Breaker close at hand. 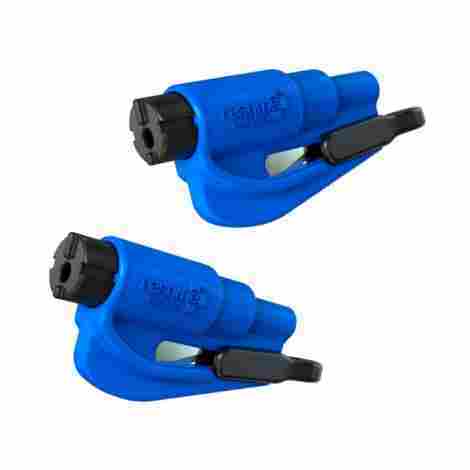 The INGEAR window breaker is a multi-purpose, tough, and rugged safety tool. Although it’s a little more expensive than some on our list we reviewed today, it is mighty! We, here at Driverzone, believe this to be the best of the best, quality-made, and a sound buy! It's definitely, a must-have safety tool for your vehicle if the unthinkable happens. Crashing in at number two is the LUXON Emergency 7 in 1 Car Safety Tool. For the safe driver on a budget, we adore this multi-purpose window breaker. It offers so much more than just a safety tool for your car. This great little hand-held product can be used for hiking, camping, home, or office. Look below to see what else this LUXON window breaker can do! The durable hammer (window breaker) is made of high-strength material. The stainless steel tip is made with corrosion protective coatings to withstand years of use. This window breaker can break all tempered glass windows. 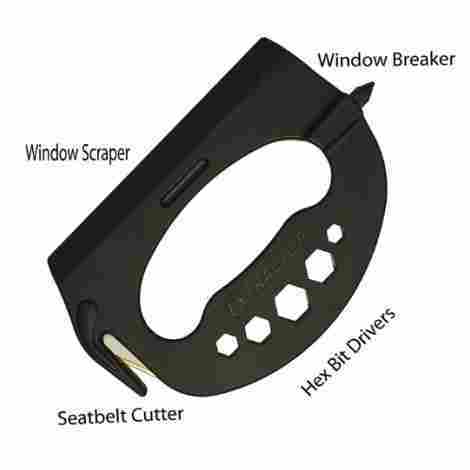 The seatbelt cutter has a strong stainless steel razor blade embedded. It is able to cut through seatbelts quickly in one swift motion to help you escape as fast as possible. Don't hesitate! 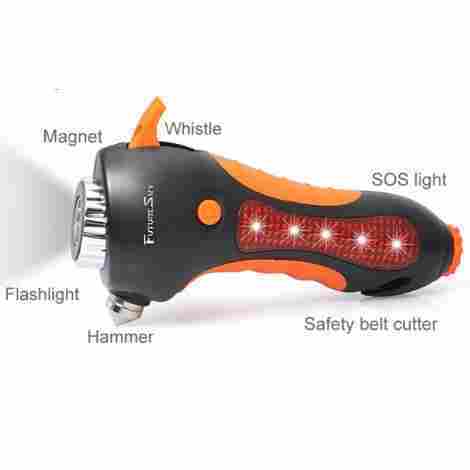 An LED flashlight, strobe (SOS), USB, and hand-crank charging system is included in this safety tool. There is also a red indicator light for emergency warning with three varying modes of use – low beam, high beam, and strobe beacon to be used with ease, making for a universal “call-out” for help. We admired the built-in magnets that can readily be attached to your vehicle, camper, or boat making you completely visible in the event of an emergency, mechanical problem, or an unforeseen motor vehicle accident. We know how significant power is in the event of an emergency, and nothing calls out safety more than a USB port that can charge your cell phone when a critical call needs to be made. Also included is this great old-school hand crank charger. No charge left on the USB? It’s no problem when this simple cranking mechanism can give you those crucial minutes that are needed for imperative communication when an emergency arises, and we really like this option offered with this unit! This is a great emergency escape tool and will provide years of additional safety margin in your driving life, staying ready for action at all times. There is so much to offer with this window breaker, at a great price. Smashing in at number three is the 2 in 1 BlueSkyBos Emergency Escape Tool Kit. We actually like this traditional window breaker which includes a solid seatbelt cutter. This is a simple lifesaving device and should be in all vehicles, just like a box of tissue. Do you recall the classic vehicles with the manual crank-down window handles? If you do not, consider yourself young. If you do, well then consider yourself a classic! Most vehicles are now made with power windows, but what happens in an accident when your power is cut off and you are trapped in your car? Hopefully, you will remain calm and reach for your dependable window breaker and seatbelt cutting tool. This a great lightweight compact window breaker that comes with a quality nylon holder that can easily be mounted just about anywhere in your car, camper, or boat. It is also small enough to be stored in a glove compartment, center console, or pocket in a door, making it completely accessible in the event of an emergency. Seconds count in an emergency, take that into account in your purchase decision. A window breaker and seatbelt cutter are not only imperative for you but also if you have children buckled in car seats. Car seats of all sorts are made to keep your kiddos safe in the event of an accident. If an accident happens, and your child is strapped into a five-point harness or a simple safety belt, this tool will assist you to get them out promptly. A few swipes with this stainless steel seat belt tool is all you need to get your child out of danger and into your arms and safe. Who doesn’t like a bargain? This certainly is our best value pick! This BlueSkyBos window breaker is offered as a two pack. Most families have more than one vehicle and when it comes to safety, Drivrzone takes it very seriously. We recommend that every vehicle you own be equipped with a window breaker to always be prepared should an accident take you by surprise. We love this 2-pack deal! ResQme, the Original Keychain Car Escape Tool, is quality-made and manufactured by a well-known USA company. This safety tool was a 2014 Red Dot Design Award winner and continues to rank high on window breaker lists today. This safety survival tool was originally developed for first responders. 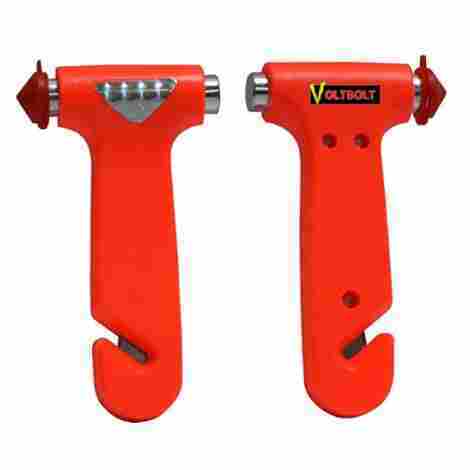 Tested and certified, this is a classic innovative design window breaker and seatbelt cutter. It is lightweight and robust and has a built-in keychain to hang just about anywhere in your vehicle or on the belt loop of your pants. This is a must-have rescue tool for all cars, trucks, campers, and boats. The trusty spring-loaded stainless steel punch allows for breaking tempered glass windows with ease. Also, the concealed stainless steel razor blade slices through the toughest of jammed seatbelts. The two most common vehicle entrapment scenarios are easily defeated with this simple tool. This product can easily be used as a keychain for easy accessibility and can hang on most belt loops, jeans, satchels, and purses. We like that they offer it in many colors, one for each family member who drives! This is a well-designed solid safety escape tool. The quality is here, the affordability is here – we really like that this window breaker comes in a 2-pack which makes it a great value, making our list at number four. 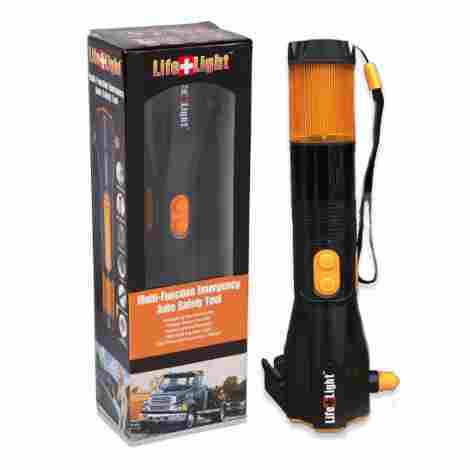 Shining in at our number 5 position is the LifeLight LED Emergency Flashlight Car Window Breaker. This multi-purpose emergency rescue tool includes many safety features, all in one tough product. We really like the 500mcd LED Flasher light with four strong magnets that can be placed on your vehicle to make you more visible in the event of a mechanical breakdown or accident. We love this safety tool because it gives you all the power you need for that unexpected emergency or collision. This product has a powerful, rechargeable lithium-ion battery. Should your battery run low, you can use the easy hand-crank to recharge the battery! This also has USB capabilities for smartphones. Place this multi-purpose survival tool kit in your car, home, and use while camping, hiking or just about anywhere! It's a great design, keep reading to see why this window breaker made it to our top 5! Once again, we love a quality-built product. This emergency escape kit is equipped with a super-effective stainless-steel punch to break most tempered glass vehicle windows. Also included is a stainless steel seatbelt cutter that will slice through the strongest of seatbelts. Here at DrivrZone, we all like our tools. But we like them, even more, when they keep us safe! This safety tool is constructed with heavy-duty plastic and has an attractive design. Included in this great emergency hand-held kit is a lanyard to slip on your wrist so you do not lose it if you let go. The LED red flasher has strong magnets to be placed on your vehicle, camper, or boat to allow emergency vehicles to find you in the event of an emergency. We really like this great little emergency escape kit, but it does come in a little more expensive than some of the other products we reviewed here today. Nonetheless, it deserves to be on our list, and we are placing it at number 5 because it truly does have a lot to offer for the safety conscious driver. After all, you can't put a price on safety, can you? Slicing in at number 6 is The Extractor Life Saving 6-in-1 Safety Tool. We truly like this product for several reasons. This is an excellent safety tool that should be in all vehicles. The Extractor easily attaches to the sun visor above your head and is easily accessible if an accident occurs and it is crucial to get out of your vehicle fast. This company offers two, (in the event one passenger is unconscious) – increasing the chance of survival of all passengers. 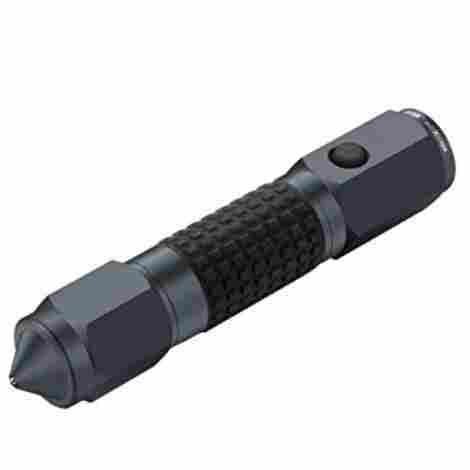 This product is made with a rugged tungsten carbide punch to break tempered windows promptly. Included is a sharp stainless steel blade that cuts through most heavy-duty seatbelts and children’s car seats. We also like that it can be attached with a simple clip on your sun visor. In an emergency, the last thing you want to do is fumble in your console for a tool. When quick accessibility is crucial, above your head may be where you want it. We all value a great tool, and having it do many things for us makes it an even greater value. A safety tool is always more useful when it is multi-functional, which is why we love this product. This safety tool is ergo-friendly and can be used as a self-defense weapon, an ice scraper, hex bit driver, and a ruler for all your needs. We like everything that this safety tool represents. It is multi-functional, and the safety tools are dynamic, superior, strong, and solid. This is sure to be a great value at a moderate cost when it comes to safety in the event of an unforeseen emergency. We were impressed with the unique design of the Futuresky Car Safety Hammer 6 in 1 Life Saving Kit. This handy emergency rescue kit is manufactured with tough material to ensure long-lasting dependability if an accident were to happen and you need to exit your vehicle immediately or alert emergency first responders rapidly. This 6-in-1 survival kit comes with many life-saving tools for when you need them most! From the window breaker to the seatbelt cutter and everything in between, we really like this product. Increase your chance of survival and make yourself visible with this handy device at your side. If an accident were to happen, you'd be ready. You might be a bystander, too. If you come across an accident scene while on your daily rounds, you would be able to render effective aid with this tool. We like how user-friendly this product is without the need for complicated manuals or buttons. Older children, elder citizens, or the physically impaired could easily operate this safety tool during those life-threatening situations. This emergency hammer is solid, compact, and an ergo-friendly safety tool, which allows your fingers to wrap around the contoured center, making it a great handheld safety tool. Although lightweight, it is heavy enough to break most tempered windows. Again, we are excited by products that have multi-function capabilities, serving more than one purpose. This window breaker does not disappoint. Included in this European-designed safety tool are the traditional window breaker, seatbelt cutter, red indicator light, flashlight, whistle for sound alert, and strong magnets to attach your light on to your vehicle to make you more visible, in the event of a breakdown or accident. We really like this safety product and we think you will too. It is very user-friendly and has a lot to offer the driver who needs and wants to feel safe in his vehicle in the event of an accident or emergency. We feel the price is appropriate for this product, making it a great buy! Drop this item in your cart, the life you save could be your own! 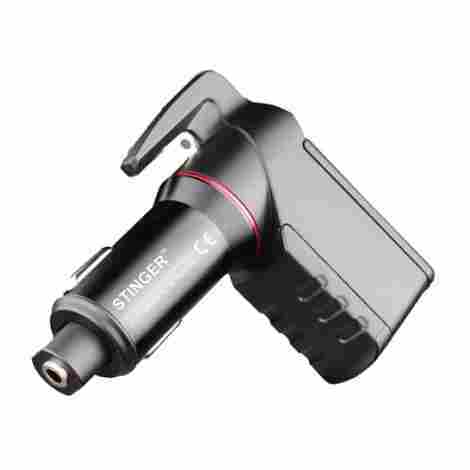 Reviewed and rated for you next is the Ztylus Stinger USB Car Charger Emergency Escape Tool. This is a patented, one-of-a-kind emergency safety tool created with a spring-loaded window punch that can be used easily and quickly to break most tempered windows. If you are ever in an accident and it is critical to exiting your vehicle in a hurry – this safety tool will do its job. We really like the stainless steel spring-loaded window punch action, making it easy for most to use. This is a very well-made safety tool, and the quality shows. Sturdy and reliable allowing for dependability if you find yourself trapped in your vehicle and need to exit quickly. It has a very strong blade to easily slice through seatbelts in your vehicle or the car seats of children. We like that this product doubles as a dual USB port charger which can be plugged into your car 12V port, overload protected to ensure no over-heating, short-circuiting, or over-charging. This is just plain handy, with the proliferation of USB devices these days, you can never have enough. This is a simply-made product, but it is simply done well. The USB ports are a nice bonus, but what we really like is the stainless steel spring-loaded action punch hammer. When safety matters, buy quality over quantity – and for the cost, we feel the value is here! 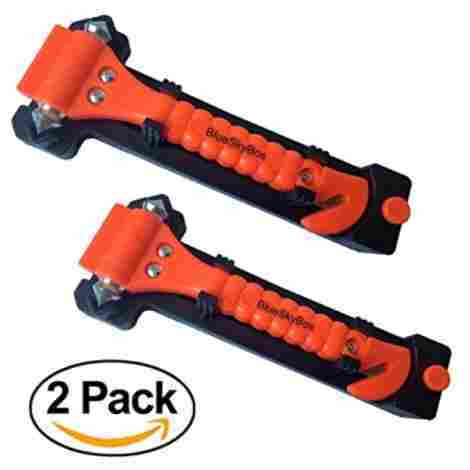 When reviewing the Family Safe Seatbelt Cutter & Window Breaker (2-Pack), we noted it to be strong and durable. Manufactured to be a tough, dependable window breaking hammer, constructed of sturdy stainless steel with a sharp punch on each side of the hammer. The seatbelt cutter also has a recessed stainless steel razor for safety. This lightweight safety device weighs in at 8 ounces, making it compact and easy to handle. The Family Safe Window Breaker will assist you in getting out of your car instantly if an emergency arises. 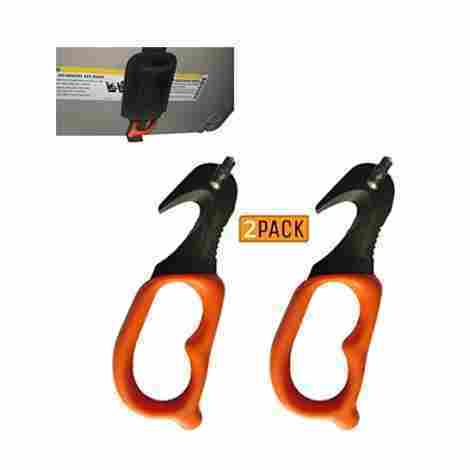 The Family Safe Seatbelt Cutter and Window Breaker come in a 2-pack. Everyone should have one, and everyone knows someone to give the second one too. A perfect purchase for the family with more than one vehicle, but if you only have one vehicle, the second one can be placed on the passenger’s side for easy accessibility if the driver becomes unconscious or is unable to reach their safety tool themselves. Nothing screams safety more than brilliant safety orange. 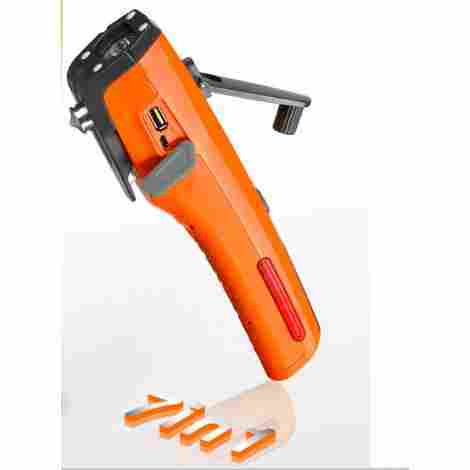 This safety tool is bright orange and will be easily found in your vehicle. We do recommend you place it somewhere easily accessible and predictable like a cup holder or in the side pocket of the door so you can find it quickly in the event of an emergency. Don't stash it away in a glove box; out of sight is out of mind! This is an inexpensive window breaker, but well-made. No bells and whistles here, but if you need it to work, it’ll do its job. The StatGear with Visor Sheath SuperVizor XT Auto Escape Tool is a well-constructed window breaker and seatbelt cutter. This product is made to be kept within arm's reach while driving in your vehicle. This is a simple product designed by a paramedic with your safety in mind. What you see, is what you get, a great window breaker that is user-friendly to ensure that just about anyone can use it. It boasts a solid stainless steel body with a heavy-duty stainless steel window punch and a sharp stainless steel razor blade for slicing through seatbelts with ease. It has a solid rubber molded finger grip that allows for a snug comfortable fit. It also has a heavy-duty nylon pouch that attaches to the sun visor for easy accessibility. The body of this emergency tool is constructed of all stainless steel. A stainless steel window punch and stainless steel razor blade make this one tough safety tool that should be in every vehicle, camper, and boat. The molded finger-grip is made of durable rubber to allow for a comfortable grasp. Solid stainless steel IS predictable. If you need to keep your family safe, including your babies, toddlers, or children in their car seats – you need an emergency escape safety tool. Included with this safety tool is a heavy-duty nylon sheath that can attach to the sun visor for easy accessibility. It allows for a smooth retraction, saving you seconds if you need to exit your vehicle immediately. Keeping it on your visor keeps it in plain sight as well, and it will not be out of sight or out of mind! These come as a 2-pack, and we really like that. The value shines, and so does the cost. Buy one for both sun visors. When reviewing and rating the best window breakers, we knew we needed to be at the top of our game. After reading our reviews, we trust that you are more knowledgeable about window breakers and emergency escape safety kits. All of us at Drivrzone want you to be prepared if the unthinkable happens. We had tough criteria to decipher and we truly believe we have found the best of the best, for all budgets, and all needs! We used the following criteria as a baseline, so much more was factored in when we created this list with YOUR SAFETY in mind! Our top 10 list of window breakers stands out above all the rest because we took the time to filter out the poorly made, and included the high-quality, most talked about safety tools on the market today! From the military-grade aluminum and tungsten steel to the stainless steel spring-loaded hammer tips and recessed razor blades, the quality is superb. Many of the window breakers that we reviewed had more than just the traditional 2 in 1 feature (window breaker/seatbelt cutter). From the strong bright LED flashlights, also featuring a flashing red light indicator (SOS) for help, to the USB power capabilities and the hand-crank power in the event your vehicle loses power. There are even a few that have whistles (for a sound alert), there is also one that can be used for self-defense if necessary. There are many to choose from, and we think we brought you a broad range to reflect the individual needs of each driver. As you can see, window breakers come in many shapes and sizes. All have a hammer punch to break tempered glass, all include the razor blade to slice through seatbelts quickly. Some do come with a spring-loaded action to assist in breaking a window. We recommend that you read the manuals and educate yourself as to how your individual model works best for you. Learn your safety tool, your life (or someone else’s) could possibly depend on it someday. We, at Drivrzone, believe being prepared and being safe while driving should never have a high price tag. Keeping this in mind, when we reviewed and rated these window breaker emergency escape safety tools, we tried to include a variety of options to suit everyone’s individual needs and budgets. We chose great products at acceptable costs and believe each of these to be of great value. Q: Are window breakers universal, or do I need to know what model car I drive before I order? A: Yes! window breakers are universal. Keep in mind they will break tempered glass only and may not break tinted windows completely if they are tinted with a film product. The window hammer should still break the glass but the glass may remain intact and the user may have to “push” the broken window out. Bottom line, window breakers are guaranteed to break tempered glass windows only. Q: What is the best window breaker on the market today? A: There are many solid quality-made window breakers on the market, and it all depends on what you are looking for, and what your budget is. Very simple traditional window breakers work just as well as the ones that cost more money and do the same thing. The only difference is, some are made with a higher-grade material and come with additional features. Bottom line, you can’t afford not to be a prepared driver in the event of an unexpected vehicle accident where you are entrapped. Determine your budget, and find the perfect emergency escape window breaker today! Q: Where can I store my window breaker in my car? A: That’s a very easy question to answer. You want to store it where it will be the most accessible to you, the driver. Some people purchase two, so they can be placed within the passengers reach as well. We recommend you find a predictable place, and easy to reach so you are not fumbling in your car to find it in a crucial situation. Chances are if you need it, you are going to need it very quickly. Place it in a predictable place, some can even be placed on your key chain! No matter where you decide to store it, remember muscle memory is important, and practice knowing where it is and how to reach it fast. Q: Is it reusable, is there a warranty? A: Yes, absolutely it is reusable, but we certainly hope you don’t have to use it at all. Most are made from heavy-duty quality stainless steel, both the hammer punch and the razor blade for cutting the seatbelt. Some also come with a lifetime warranty. Check with the manufacturer for all your important questions and guarantees.